Home » News » Supersonic Announce Jarboe, Ufomammut, Merzbow, Hey Colossus, Drunk In Hell + More! 2012 marks the Ten Year Anniversary of this dynamic, experimental, multi-disciplinary arts festival, which identifies the otherwise indescribable connections between contemporary music, art, performance and film. To commemorate this impressive and very special milestone this year, Capsule propose to work with Supersonic alumni and emerging artists to celebrate the achievements of the festival thus far whilst also focusing firmly on the contemporary. Because as well as giving a warm welcome to many influential, era-defining artists over the years, Supersonic always has an uncanny knack for highlighting new acts before everyone else is talking about them. As ever, Capsule‘s programme has a sense of spectacle at the very heart of it, always aiming to capture the imagination of the audience, and with a friendly, bustling atmosphere to boot, there is little wonder why the festival draws fans, performers and industry folks from across the globe. Momentum is really starting to gather now as Capsule continue to shape the entertainment for the epic TEN YEAR ANNIVERSARY of Supersonic, the UK’s most distinctive and respected music festival. Having recently announced the initial line up and the addition of Kim Gordon’s BODY/HEAD, we can now proudly announce even more artists to this extra special event including; iconic avant garde musician Jarboe, once a member of Swans, now delivering one of her unique visceral solo performances. The ever-elusive and always entertaining Hype Williams are also confirmed to be part of this landmark celebration, guaranteed to create a one-off, unforgettable performance. We are beyond excited to welcome Italian sorcerors of monumental and obliterating psychedelica Ufomammut to the festival, a perfect addition considering the strong visual element to their live performances. This appearance will be hot on the heels of the much anticipated release of ORO: Opus Alter, follow up to widely acclaimed, Opus Primum. Now onto someone who is a by all accounts the master practitioner of abrasive, highly creative and extreme noise, Supersonic proudly welcome back, Merzbow. Kevin Drumm has warmly accepted his invitation to play at the festival, having emerged from Chicago’s improvised music scene, in the 1990s he became one of the world’s pre-eminent prepared guitar players. Since then his work has expanded to include electroacoustic compositions and live electronic music made with laptop computers and analog modular synthesizers. Drumm’s work draws upon musique concrète, electronic sound, improvisation, heavy metal, and noise music. He is also a black metal fanatic, so his promises to be one very varied performance indeed. Next up for some local talent who have been at the heart of the Birmingham electronic/dance music scene for many years, we are of course talking about dance-floor heroes, PCM, after all, it would be impossible to celebrate 10 years of Supersonic without them. Also added to the line up; the mesmerising multi-layered abrasive noise of Clifford Torus, noise rockers Doomsday Student (the phoenix rising from the ashes of Arab on Radar) and Drunk In Hell back by popular demand after becoming a favourite of many at last year’s festival. Also coming to join the tenth birthday festivities are Leeds based psych rockers Hookworms and Hey Colossus, a band who have cut their teeth in the noisier realm of the music business for many years now, and they are sounding better and better for it! Also performing will be Thomas Ankersmit, a musician and installation artist who plays serge analogue modular synth, computer, alto sax and is known for his collaborations with minimalist and electroacoustic artists such as the aforementioend Kevin Drumm. Now onto another multinstrumentalist who is no stranger to Supersonic Festival, KK Null and also making up the Japanese contingent, legendary drummer Tatsuya Yoshida (Zeni Geva) only this time performing as Ruins Alone. Australian minimalists My Disco are heralded as the most danceable guitar band around, therefore making a perfect addition to this already bustling line up, and from one end of the musical spectrum to the next (as is the way with Supersonic) the skewed troubadour Richard Dawson will grace the stage, as will Stian Westerhus with his otherwordly jazz inspired improvised sounds. As previously mentioned, Supersonic are known for being the ahead of the curve introducing new works by new and existing performers, the next addition to the line up proves this point well; as performing under the name SWLLWS, Sian Macfarlane explores the world of seance in Victorian times using a mix of super 8 footage as well as found sounds. This one promises to be very intriguing indeed. Finally, as if all of this was not enough, Supersonic are delighted to announce the krautophonic blizzard-wave duo Warm Digits, known for their semi-improvised brew of metronomic rhythms, snowstorm guitar, radiophonic electronics, dual-laptop electro, swathes of no-wave guitar and frantic free jazz drumming. Believe it or not, there are still some more very special additions to add to their already mega tenth birthday line up which we shall unveil soon, as well as more information about the art exhibits and film programme which is still taking shape behind the scenes. But for now, please enjoy this Supersonic Festival mixtape which Capsule have compiled, featuring a selection of the line up so far, for your listening pleasure. Please feel free to host this on your site and help us to spread the word about this exciting milestone event which by the looks of things, is going to be absolutely unforgettable. As a reminder, here is a list of the line up as it stands; Body/Head/Bohren Und Der Club Of Gore/Carlton Melton/Clifford Torus/Dope Body/Drunk In Hell/ Dylan Carlson/Flower-Corsano/Goat/Hey Colossus/Hookworms/Hype Williams/Jarboe/JK Flesh/Kevin Drumm/KK Null/Lichens/Merzbow/My Disco/PCM/Rangda/Richard Dawson/Ruins Alone/Sir Richard Bishop/Six Organs Of Admittance/Small But Hard showcase/Stian Westerhus/SWLLWS/Thomas Ankersmit/Tim Hecker/Ufomammut/Warm Digits and Zeni Geva. 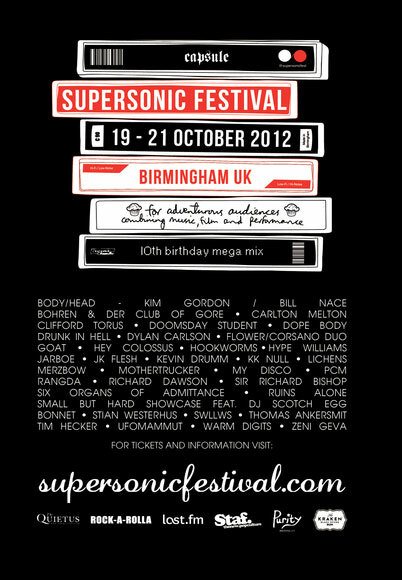 Supersonic takes place between 19th-21st October 2012 at The Custard Factory, Birmingham, weekend tickets are available from theticketsellers.co.uk and full listings and latest news can be found on the festivals website at www.supersonicfestival.com. Shaman Recordings: Nature Is The Devil’s Church On Discogs – DO NOT BUY!